Fayrial growled under her breath as she strode quickly away from Leothir’s suite toward the kitchens, pressing her hand to her head. The oblivious lordling wanted a “light dinner”, not realizing that his companion hadn’t eaten in the better part of two days, and it made her want to either shake him or punch his smug, clueless, pasty little bloodelven face. She fisted her hand by her hip, her expression thunderous, until she rounded a corner and nearly careened right into his brother. Try though she did, the night elf couldn’t keep her lips from twitching down. “No. It isn’t.” That she said no more was telling, and perceptive Relare’s eyes narrowed on her face. The former sentinel pulled away from his hand, taking a couple of steps back. In silent, moderately hostile contemplation, she stood there, still and watching him as she considered his request. Finally, she pressed her lips together and turned away, beckoning Relare to an open side door into a small workroom. She led the way, her teal braid swinging with her gait, until they had relative privacy, the door clicked shut behind them. Her words, harsh and unflinching, had him clenching his fist and pressing it against the wall, his thoughts racing. She was right. And he was close. He thought of Swelltide, his own personal army poised to strike a decisive blow against the Sunbane leadership and end the war. He thought of Leothir, content to let his mother rule the house while he played soldier and traveled the world. His brother would take his place if he knew…. Yes, there were paths between what he had and what he wanted, and Faye was right. It was past time to fight, and power enough to help them – to help everyone – was either in his grasp or not far beyond his reach. Relare nodded to himself, watching his mother’s slave reach up and wrap her hand around the cursed collar at her neck, tugging. Faye gave him a dark smile, one fist still clenched by her side. “You see it, now,” she said softly, her canines sharp and fierce. “We play our part, Relare, but we are not slaves.” The proud warrior stood straight-backed and tall, her gaze intense, and repeated what was recently said to her: “We are the children of the stars… and we will not be cowed. Relare grinned and chuckled as she hurried away down the hall, mumbling quietly, “I suppose that’s fair.” He turned back toward his brother’s suite and strode off with new purpose. Some time (that was significantly less than two hours) later, the auburn-haired paladin dozed on the couch in his brother’s sitting room, his cuirass and gauntlets draped across a chair. He waited patiently, only cracking open an eye when Fayrial slipped into the room with a platter laden with food and drink and scratched at the bedroom door. Though he raised his head and stretched, the night elf ignored his presence in the room. “Master Leothir, your dinner,” she pronounced quite loudly, intending for her voice to carry through both the wood and whatever might be distracting them on the other side. Her gaze slipped sideways to glance at Relare as she waited for his response, and a minute ticked toward two. When the portal cracked open, Leo stepped out in his breeches and little else, his golden hair loose around his shoulders. His brother smirked as Faye grit her teeth and handed him the dishes. He could tell that she was trying not to let her eyes stray to the reddened scratch marks on his toned chest; they were enough to make even the stalwart and worldly warrior wince, probably attempting not to imagine how they got there. Possibly worrying about a scenario of reluctance that Relare knew Leo could never be guilty of in a million lifetimes. As the paladin strode across the room, his gaze fell on Rhoelyn with new awareness of why she looked slightly wan as she sat in the upholstered chair beneath the window, tucked into Leo’s tunic for decency. The little priestess looked over at him and flushed slightly darker under his examination, tugging the fabric lower over her thighs and forcing her gaze back to Leo as he complained. He didn’t feel his brother’s glower aimed at his back, and by the time he turned, it was replaced with a bland smile. “Alright, you two. Try to control yourselves until I leave, if you would. I don’t think I want to know any more than I already do about your… more intimate moments,” Relare joked lightly, pulling up a stool beside Rhoelyn’s chair. Before he sat, he grabbed the cup of water off the table beside her and shoved it into her hand, gentle but unsubtle. She smiled gratefully and took a dutiful sip, her relief showing nowhere but in the depths of her fever-bright eyes. The paladin sighed without sound, knowing that she was too good at hiding for his brother to stand a chance of seeing through her. That had to change, for both their sakes. Still, Relare concealed his thoughts almost as well as Rhoelyn did, instead just reaching out to press the inside of his wrist against her forehead. Her temperature was high, but thankfully not ragingly so. He brushed her hair back from her temple with a gently glowing hand, leaning forward to look carefully in her luminous blue eyes. As he examined her, he found the answer to the most pressing question in his mind, and his eyes widened. The priestess blinked in surprise for a moment before lowering her eyes as she set the cup of water back down. “I’m afraid I simply do not know what happened, brother. I had… I had very odd dreams in the night, and when I woke…” She shrugged slightly, looking back up at him uncertainly. 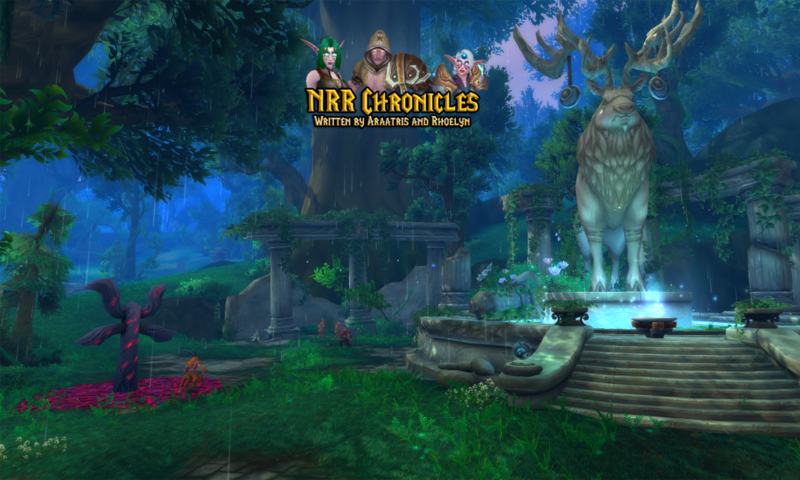 Though there was clearly something she wasn’t saying, Relare found he believed her confusion to be genuine; the night elf really didn’t know how she’d gotten mired in a partly-formed spell. “Thank you, Relare,” she said softly, closing her eyes and lowering her guard to allow his magic to mingle with hers. It didn’t take long to unravel the spell and release her mana, though it was built up so badly that it wafted free of her in visible waves as she shuddered. Leothir knelt beside his lover and wrapped his arms around her shoulders, holding her tight against the uncomfortable sensation until finally she relaxed against him, sighing with relief. “Good,” he nodded curtly, standing to once more grab her cup of water and shove it at her, this time along with a piece of bread. Again, she took both with a grateful look that had depths that Leothir missed. The mage just chuckled at his brother’s pushy behavior. “I’m worried,” Relare continued. “I want you to let me know the minute this – any of this situation plagues you again, Rhoelyn.” The paladin gave her an intense stare, a meaningful edge to it that she caught easily. He could see when she realized just how much he knew. Leothir had no idea just how appropriate his words were, hence he was surprised when her eyes suddenly shone with tears. She glanced back to Relare to hide her reaction, lowering her head on the pretense of taking a bite of her bread. As Relare growled in mock insult, he was pleased to note that Rhoe giggled, wiping her eyes dry and enjoying their antics. She looked tired, but only that, her pallor and clouded gaze both gone for good. “You, brother, are really asking for latrine duty next time we go back to camp,” he asserted with a pointed finger, holding his glare for only a moment before the horrified look on Leothir’s face ruined his act. The paladin interrupted by bursting out laughing, and soon Rhoelyn was giggling with him as Leo sputtered. Relare chuckled. “I know a royal dismissal when I hear one.” He leaned down to plant a quick kiss on Rhoelyn’s cheek, plucking a slice of cheese from the plate and shoving it into her fine-boned hand beside the bread. Then he grabbed a second chunk before he turned and wandered back toward the door, popping it in his mouth.